1. 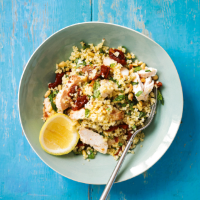 Place the bulgur wheat in a small saucepan with 150ml boiling water, cover and simmer gently for 4-5 minutes, allow to cool and stir in the pine nuts, chopped tomatoes, chicken and basil. 2. Whisk together the lemon zest and juice with the tomato oil, toss into the salad and season.